Former BWW Award winner Emrhys Cooper opens up about his latest projects. 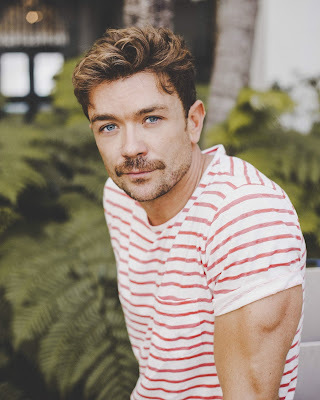 Always a man on the go, delving into athletics, modeling, dancing and having fun, his work usually aims to please. As an actor he is equally adept at comedy and drama. From the photos, it all looks terribly exciting. What brings you back to LA this winter? I believe I read you are doing a film. Tell our readers all about it. I’m shooting a horror film called Dreamcatcher a sort of modern day “Scream”. Jacob Johnston wrote the script and will helm the film as his first directorial feature. It’s an ensemble piece that follows a group who plan to avenge the mysterious death of their friend at a Music Festival, only to end up stalked by the same assailant. I am having the time of my life on this project. I couldn’t have asked for a better cast and crew. It was just announced in Deadline. A short film you did Trophy Boy is about to receive a TV adaptation. Tell us about that in detail. We’re so proud to be working alongside the prestigious Dynamic Television to bring this series to life. 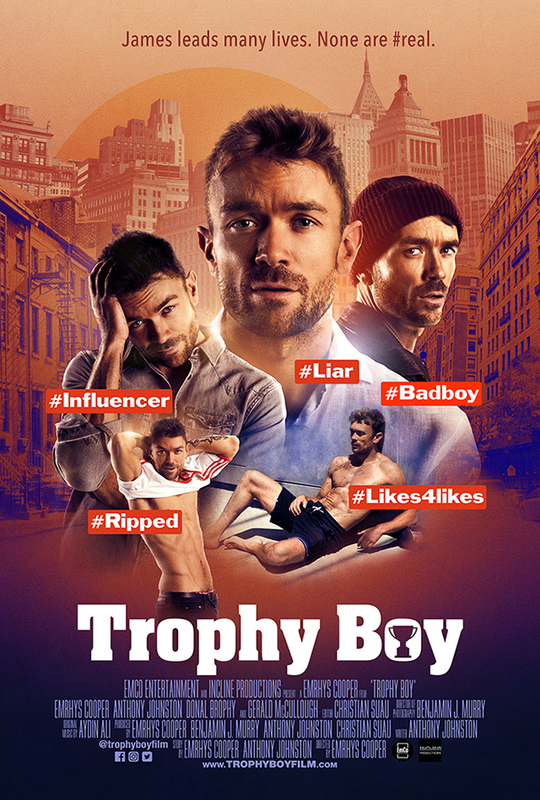 The series Trophy Boy delves deep into the salacious world of four social media “stars”—where the audience quickly learns that all that glitters is not gold. Everybody can be bought, but at what cost? It’s a psychological exposé of a group of friends who appear to be famous on social media but are actually going on journeys of self—either self-improvement or self-destruction. The characters live duplicitous lives, one carefully curated and ring-lit online, and the other a pale comparison, rooted in the harsh lighting of reality. Trophy Boy is a gritty dramedy in the real life style of HBO’s Girls meets Entourage, with a dark poetic vision in the vein of Steven Soderberg’s The Girlfriend Experience, about four colorful friends and their lives and trials in New York City. which they soon find out is a fickle dollar. Behind the smoke and mirrors of online fabulousness lies a darker truth. The characters will go to any length to attain fame and notoriety—even if they have to trade their bodies to get there. Strangely enough since you left LA a couple of years back, your film career seems to have picked up greatly. Why do you suppose with your move to New York that this has happened? Is there actually more film work generated in New York than in LA? An artist should always live where they feel most inspired. LA had started to feel drab and moving to NYC lit up my imagination,. The irony is not lost on me that the films picked up after leaving Hollywood,. In the end I feel like New York is a good place for me at the moment. I am also lucky to have found a wonderful team who have really believed in me and pushed my career. What other successes have you experienced in New York? Any offers of theatre work? I set up my own production company EmCo Entertainment and I have been busy writing & directing my own projects. I haven’t had a moment to do any theatre, but I am dying to get back on stage and find the right project. I have been thinking a lot about Oscar Wilde. Later, hopefully I will manifest some time for his writing in my life. You received a BWW Award a few years ago as an Outstanding Newcomer., based on your work in a local production of Entertaining Mr. Sloane. Did the play affect your career? If so, how? I was really surprised and humbled by how the audience responded to that sociopathic role LOL. Playing Sloane definitely helped open some doors, as three weeks after we finished, I booked a role of Desperate Housewives, I think it helped that the creator of the show Marc Cherry came to watch. Tell us more about your production company and other projects that await you in 2019. I am super proud of the work EmCo has already achieved. The first project Trophy Boy premiered at the Cannes Film Festival last year, and is now being turned into a TV show. Up coming projects include Nosferatu, a dark comedy set against the dark world of self help. At EmCo Entertainment we produce film, TV, theatre and original online content that is both highly entertaining and contains a thought-provoking message for the audience.We believe that the digital currency for the 21st Century is the ability to capture and hold people’s attention. This criterion is the blueprint for all our creative ventures.We are a New York based team of industry experts who offer a top quality, full-package approach to any production need. We collaborate effectively with all our clients to bring their innovative ideas to a global marketplace.